Like a lot of people, I wondered who would rent it. At $6,000 a night, the Ritz-Carlton Suite at the luxury brand’s new Wellington Street location sounds outrageous and out of step with these times, when wounds of the recession remain fresh. 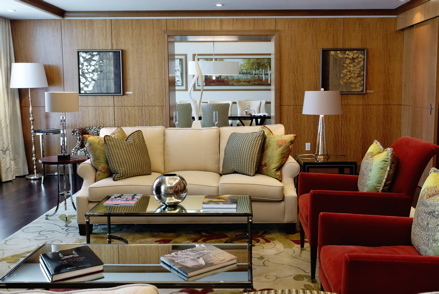 The suite is intended for political dignitaries as well as business executives and celebrities who want to show off. So, when I was offered the opportunity to be the first person to spend a night in the suite, I first pondered what I would do with it, and then I thought of “Risky Business” and Bob Seger’s “Old Time Rock and Roll,” the film’s signature song whose first few chords evoke musings of mischief behind closed doors. I concluded that I should test the 2,500-square-foot space by using it for a party — one without Hollywood-inspired shenanigans. The suite has a full kitchen, dining room for eight and living room with a 50-inch LG HDTV. A handful of guests from different walks of life joined me. The Ritz is exquisite, of course. Chef Tom Brodi, whose restaurant Toca (the name stands for Toronto, Canada) is on the second floor of the hotel, and his team prepared canapes that included bite-size bison tartar topped with a sunnyside-up quail’s egg and tasty portobello carpaccio with pinenuts, argula and parmesan. Wine director Taylor Thompson displayed his know-how during a tasting of velvety 2007 Pinot Noir from Le Clos Jordanne, a winery in Jordan Station that gained notoriety in 2005 after its Chardonnay won a blind-tasting against global heavyweights in Montreal. General manager Tim Terceira has assembled a staff of dignified professionals who converse affably with guests and marvel themselves at the Ritz’s décor, views and ambience. That is the real dazzle. You might think Ritz-Carlton — a century-old hotel empire known for its collection of five-star ratings and high-profile roster of guests — would be so full of itself it would import its luxury trappings from abroad to this market, home to its 74th property. The biggest surprise, though, is the immense effort the hotel and its restaurants have made to celebrate things local, whether it be artwork featuring Ontario’s windswept landscape, wine from Prince Edward County, or fine cuisine using ingredients from the GTA and Niagara region. No matter where it comes from, it’s refined, and that goes extra for the showcase unit. The suite’s evening turndown service includes the laying out of sea salt and a soothing bottle of specially made bath oil, displayed amid candle light. The walls and heated floor of the immense master bath resemble a museum hall. Its mirrors feature embedded HDTVs and the shelves are saturated with Bulgari bottles. When someone says “five-star”, this is tangible evidence of the term. Guests of the suite have use of the Club lounge, which features five food settings a day, including a large breakfast with some of the best pastries in town and a decadent dessert service that starts at 8 p.m. In-room dining can be provided by Toca or Deq, the hotel’s casual bar that is sure to be home to one of the hottest patios in the city. It can hold 100, features an open-air firepit for pizza-making and a view of the CN Tower that will no doubt make many necks ache. Once Bay St. discovers it, Deq will overflow. The amenities are superb, but the suite isn’t faultless. It could use a doorbell, for sure. Parties often wind up in the dining room or kitchen and when ours did it was impossible to hear a knock on the suite’s front door. We received a phone call telling us a hospitality worker was outside waiting to bring in a room service order. And the entertainment unit, with a series of remotes, is confounding. To fully enjoy it, you would have to spend too many minutes to figure it out, and you wouldn’t want to do that during a short stay. I can see the suite being rented for business meetings, small cocktail parties similar to ours, special family occasions and weddings, whether it be a place for the bridal party to assemble before or after a reception or as the spot for an intimate ceremony.